You know how Discovery Channel has Shark Week? Well get ready, the Hungry Redhead proclaims this to be: Pumpkin Week. Ahhh! Get the kids out of the kitchen! Toss me the oven mits! The oven mits! We’re about to step into a giant cage and be lowered into the depths of spicy, squashy baked goods. 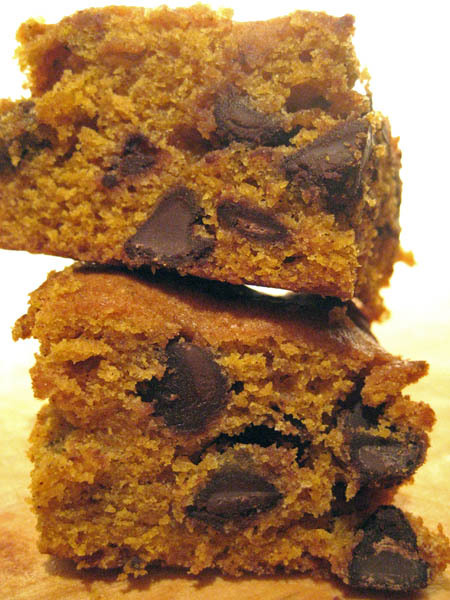 And when I say it’s “Pumpkin Week,” I mean there will be pumpkin recipes today, tomorrow and Wednesday. Thursday is a holiday and Friday will be another fresh Fired Up Friday pick. So it’s a pumpkin trilogy then. I hear the kids like trilogies. 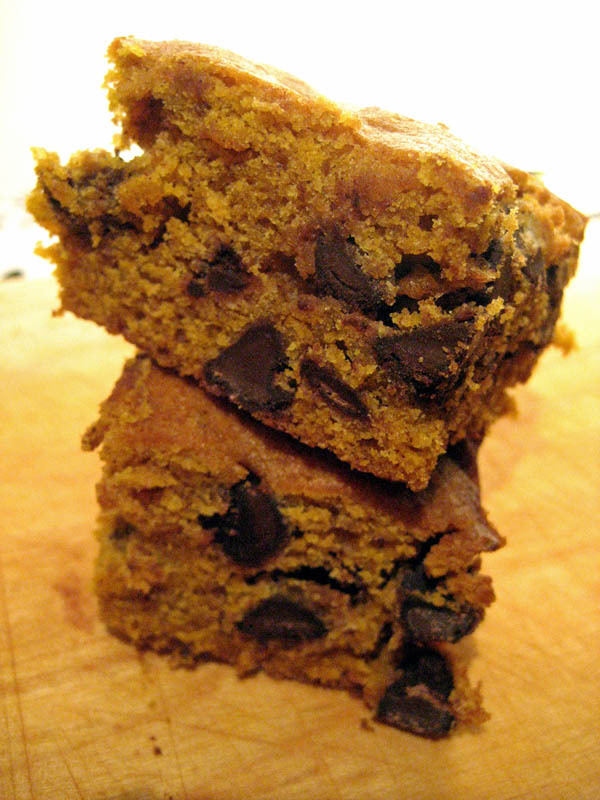 Up first is Pumpkin Chocolate Chip Bars. I get lots of requests for this recipe and it pains me to admit that it’s a Martha Stewart recipe. Well, it used to pain me to admit that when I thought Martha Stewart was a pompous wasp of a woman and it was an act of desperation to use her recipes. As it turns out, the former felon knows what she’s doing (or her editors do anyway) and I’ve learned that if you need a solid recipe – Martha is the place to start. Usually Martha Stewart recipes are more complicated or elaborate than your average recipe, but these are as straight forward as you can get and thus, pretty difficult to mess up. They’re very thick, soft and cakey. They’re not dense like a brownie or a blondie. The ratio of pumpkin to chocolate is perfect and the chunks of chocolate give a nice break from the fluffiness of the bar itself. 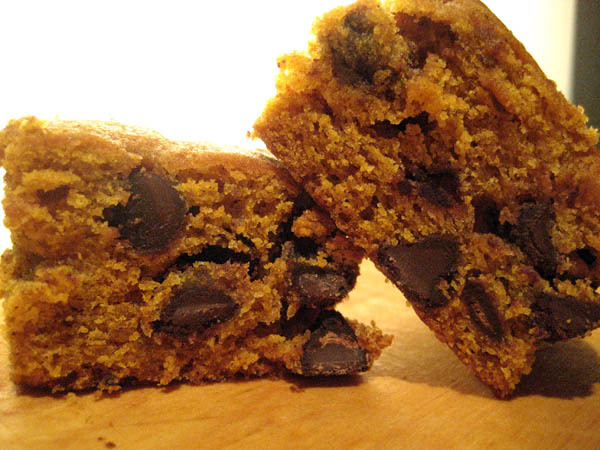 Since we’re talking about pumpkin and chocolate, can I give you a tip? The next time you get hot chocolate from a coffee shop, ask them to give it a shot of pumpkin syrup. It’s like fall day in your mouth! Minus the wet leaves. If you’re missing someone this holiday season, I suggest sending these. They’re sturdy and hold up well in the mail. They do not hold up well in my kitchen, since I’m convinced anything with pumpkin can be eaten as breakfast, or really any meal, because it is a vegetable. *If you can’t find pumpkin-pie spice, substitute 1 1/2 teaspoons cinnamon, 3/4 teaspoon ginger, 1/2 teaspoon nutmeg, and 1/2 teaspoon each allspice and cloves (all ground).